Weird death metal is having a banner year. Portal, Abyssal, Wormed, Svart Crown, and Defeated Sanity have all put out strong albums already; Ulcerate and Gigan will pile on before the year is out. Gorguts, the weird death metal band par excellence, are leading the charge. Colored Sands — their first album in 12 years, and their first since the suicide of then-drummer Steve MacDonald put the band on ice — has so far achieved nearly universal critical acclaim. This is no small feat for a forward-thinking death metal album in a market environment that currently favors tradition (or imitation, depending on who you ask). The conversation around Colored Sands has mostly focused on where it fits into Gorguts’s discography: does it sound like a Gorguts album, despite the new lineup? Does it live up to Obscura and From Wisdom To Hate? Which album does it sound more like? Will it prove as influential as their past efforts? These questions distract from the album as an entity unto itself, which is a shame. Colored Sands sounds like Gorguts, but does not hew to the template of an earlier record; it just sounds like Colored Sands. Like all Gorguts albums, it is a product of the lineup that produced it: Kevin Hufnagel (Dysrhythmia, Vaura), Colin Marston (Dysrhythmia, Krallice, Behold the Arctopus), John Longstreth (Origin, 19 other bands), and Luc Lemay, the band’s sole constant member. Lemay wrote the bulk of the song structures, but each musician devised his own parts. The result is a compositional marvel. If Gorguts has a defining trait, it is not their weirdness but their clarity. These are long, layered songs, but they don’t feel that way. Brutal segments flow into restrained passages seamlessly, like organic tissues. Hooks emerge on the first listen. The performances are crisp, clean, and measured. Lemay has a side interest in woodworking that sometimes rivals his interest in music; he says that he just likes to work with his hands. Colored Sands, for all of its complexity, reflects his utilitarian sensibility. It is a work of craft as well as a work of art. For his part, Lemay does not seem at all fazed by the monster expectations placed upon his latest work. His calm comes from experience, not arrogance. He is a modest artist who acknowledges his own limitations, but who has earned his comfort in his own skin. Colored Sands, your fifth Gorguts album, brought you back into the studio for the first time in over a decade. Was this album easier or more difficult for you than past recording efforts? No, it was not a difficult album to do. My vision was pretty much clear from the beginning. But that being said, that doesn’t mean that I didn’t hit any walls. Composition is not always an easy task. You know, my composition teacher at the Conservatory always said: “Writing music is solving problems. Every time you choose to write down a note on paper, you then need to decide what you’re going to write next,” and that’s not always an easy thing. The collaboration with John, Colin and Kevin was awesome! They made this project very stimulating for me. They’re very creative, intelligent people, amazing Artists, great individuals, and great instrumentalists. It happened on each record. I remember, for instance, when I wrote the song “Inverted” on From Wisdom to Hate. I got stuck on the middle slow parts for months…and then I was explaining to Dan [Mongrain, FWTH guitarist] what I was picturing, without being able to put my finger on it. Dan played something on a specific rhythm I explained him, and from there everything got clear! I finished the song in a snap. 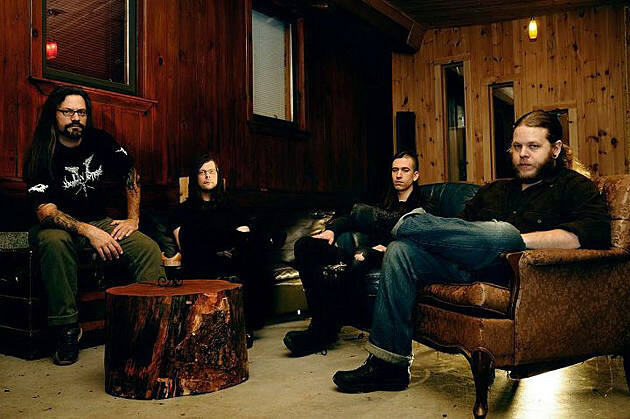 You are the only constant member of Gorguts, but the band has always been collaborative. Each album is reflective of the lineup that produced it. What new attributes do Kevin, Colin, and John bring to the band? Well, first they have very distinct personalities; hence it’s reflected in their own styles as players. They were fans of the band before joining the band, so they brought their own fingerprints to the “Gorguts style” in their own way. It’s like if you would ask three different people to draw a table on paper. You’re going to recognize the object 100%, but it’s going to be very different from each point of view at the same time. So they understood the band’s aesthetic very well, but they’ve brought it in their own style. Patrice Hamelin has been playing live drums for Gorguts since last year. Is John Longstreth still a member of the band? Patrice has actually been filling in for John for 2 years now. John is still very busy with Origin, so that’s why Patrice is behind the kit for us! Yes, John is still a member of the band. One of Gorguts’s finest traits is the way you balance weirdness and dissonance with melody and catchiness. Few metal composers could do the same. How do you go about writing melody lines and choosing chord voicings for your riffs? Only by ear. Ear is the only judge here! No theory or anything. Too often, people will put technicality in the same box with music knowledge, and it doesn’t work like this for me. You can be the greatest player on your instrument with all the imaginable skills you can think of, but that’s not going to give you necessarily an instinct or intuition for composition. It’s not because you’re a good orchestrator that you will have a good sense of melody. I often read, in the past, people saying that Obscura was complex because I studied classical music and I knew about theory and all that stuff. Well, Obscura was written three or four years before I even went to the Conservatory. It’s all about instinct and intuition. Then, theory to some extent will come into the picture as a tool to make your melody evolve on a more complex musical canvas. 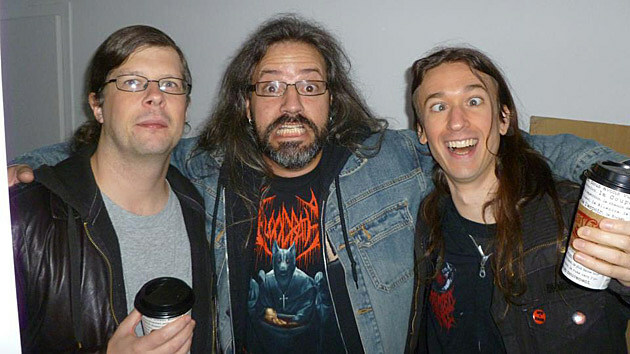 Why do you think so many people see Gorguts as a cerebral, academic entity? Are they listening the “wrong” way? Maybe in their minds, technicality equals academic. There’s no good or wrong way to listen to us; it’s only a matter of perception. Like I said, the Conservatory experience has nothing to do with the Obscura sound. This sound comes from a collective collaboration, with a vision and a will to do a “table raise” from the typical death metal ingredients. The new album feature a classical-style string composition, called “The Battle of Chamdo,” that I can only assume you wrote. Does your writing process in this idiom differ from the way you write metal music? How was it recorded? Yes, it differs. When I write orchestral music I write on the piano. Not that I have skills as a pianist, but I like the piano better to write polyphonic music. It suits me better to hear chords colors and to orchestrate as well. Also, by using the piano, I will find ideas that I would have never found on the guitar, and the other way around. As far as recording, I hired a string quintet — two violins, one viola, one cello, and one double bass — and Colin recorded the ensemble. They played to a click, and we did a few takes with the mics closer [to the instruments] and a few takes with the mics farther away. This way, we have the feel of a chamber string orchestra. After that we recorded the solo violin and the solo viola for certain passages. Do you have any plans to record and release albums in that style? I remember coming across some impressive classical works of yours on your old MySpace page some years back. Yes! I would absolutely love to do a full orchestral music record! The only issue I have is the money. It cost so much money to have a chamber orchestra rehearse and then record the music. I’ve already contacted the leading violinist who performed on “The Battle of Chamdo” to ask him if he could record my violin sonata. So maybe we’ll see this happen is the next year or so. I want to get more into orchestral composition in the next months and year for sure! People often talk about how technical Gorguts is, but you’ve said in other interviews that you don’t consider yourself a technical player. What do you consider your strengths and weaknesses as a guitarist? My strength would, maybe, be a good sense of melody. And my weaknesses would be the technical aspect as a guitar player. I’m not into sitting down for hours and practicing scales. I’ve always said that I don’t really see myself a guitar player. Guitar just happened to be my tool of expression. I see myself as a composer more than a guitar player. You reformed Gorguts at the suggestion of former member Steeve Hurdle, who passed away last year. He was obviously a close friend of yours. What do you remember best about him? I remember a very creative individual; a poet; a very sensitive and visionary player that would challenge me all the time with new ideas by pushing the forward all the time. FORWARD is a good word that captures his way of thinking within Art and the act of creating in general. You’ve been doing this for a long time. If you had to give one piece of advice to young metal musicians who are forming their own bands today, what would it be? Be CURIOUS and challenge yourself with new ideas. Put yourself out of your comfort zone when you write, and be a hard worker. Also, all of this has to be fun! I’m 41 now and I’m enjoying this as much as when I was 16! I’m very happy to see where the style is right now when I hear records by Ulcerate, Deathspell Omega, Dodecahedron, and Nero Di Marte. I don’t have the feeling that death metal has gone full circle. This being said, I’ve always seen death metal as one of the most open-minded, creative, bold and Artistic styles of metal. So as far as what the style holds for the future: it’s up to us, the Artists, to keep pushing and challenging ourselves as composers. Gorguts will release Colored Sands on August 30th. Check out brief posts on their song debuts here and here, as well as our obituary for former Gorguts guitarist Steeve Hurdle.